The accessible, inexpensive peanut can help curb your appetite, stabilize blood sugar, lower blood pressure, decrease your risk of heart disease and more. Whether your goal is better overall health or weight loss, there are many reasons why you should include peanuts in your diet on a nearly daily basis. Also, note that moderation is the key since peanuts are high in fat. One to one and a half ounces a day will provide the health benefits outlined here. One of the most common types of cancer is colorectal cancer and researchers agree that an important role in prevention plays a diet. In one study it has been shown that women who ate peanuts at least 2 times a week had 60% fewer chances of getting colon cancer. On the other hand, men who ate peanuts at least twice a week were 29% less likely to get colon cancer. The reason for the decrease is folic acid along with other cancer-fighting nutrients found in peanuts. Tryptophan can be found in peanuts, which is an essential amino acid that is important for the serotonin production, which is one of the main chemicals in the brain involved in the regulation of mood. A decreased amount of serotonin is released in the brain from the nerve cells when depression occurs. When there is an increased amount of serotonin in the blood, tryptophan can raise serotonin’s antidepressant effects. According to one study, participants who ate a lot of peanuts had about 30% reduced risk of coronary heart disease incidence. This reduces your chances of dying from heart disease by a third. Fatty acid profile of the nuts and other components reduce “bad cholesterol” or LDL-cholesterol, which results in healthier hearts. A good source of vitamin B3 can be found in peanuts and that is a reason why peanuts are called “brain food.” Vitamin B3 or niacin content have a lot of health benefits, which include boosting memory power and normal brain functioning. According to one study, people who replaced one serving of red meat with one serving of peanuts daily reduced their risk of diabetes by amazing 20%. Peanuts can keep your blood sugar levels lower all day long if you eat them in the morning, and peanuts also slow the absorption of carbohydrates. It is amazing how this very salty snack food can be fine for even sodium-restricted diets. One ounce of salted peanuts has less sodium than an average frozen waffle, ¾ cup of bran flakes, or 1-ounce slice of bread. Peanuts make you feel fuller for long period of time since they are high satiety food. In one study, participants ate less after they snacked peanuts. The satiety value of peanuts isn’t solely a result of their protein, fiber, or fat content, but rather from the synergy of all of these components. Also, if you have peanut butter or peanuts for breakfast, you may eat less during the day. 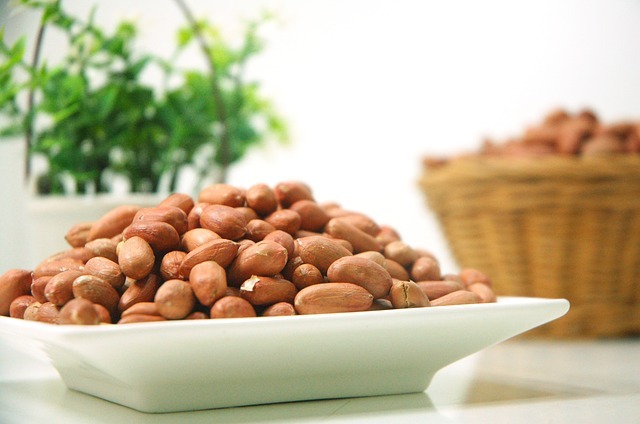 You will feel fuller for a long period of time because peanuts have the effect of stabilizing blood sugar.